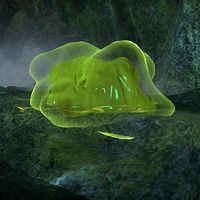 Voriplasms are mobile green slimes which attempt to devour anything that crosses their path. Each smaller voriplasm is part of a greater whole and thus can be considered to be part of the same creature. They can be found deep in the Black Marsh as well as closer to the coast, such as in Murkmire. The voriplasm will spread out and attempt to grab target, if successful it will hold the target in place as it slowly consumes them. Breaking Free will allow the target to escape. Close range physical tack. Spikes form out of the mass and jab at the target. 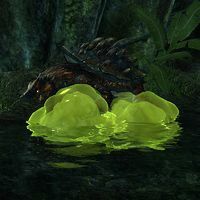 The voriplasm will leap away from their target and spit a green lump which grows into a smaller voriplasm, as well as causing AoE damage where it lands. Ixtaxh Voriplasm: Acts a final trap obstacle in the Ixtaxh Xanmeer. The Wuju-Ka Guardian: Created by Wuju-Ka's greater consciousness to guard its' pool. This page was last modified on 8 December 2018, at 10:57.